There is some restriction however in playing the video format file in default operating system as it will not support it; conversion is needed to play it. Among few options support to watch the video Make Instant Player is most convenient option for the conversion of video into Executables, Make Instant Player make possible by combining the video with a video player that is capable of playing the video. 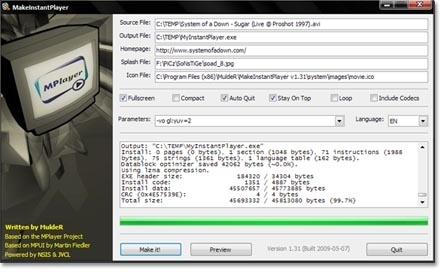 Make Instant Player free software program combines the popular video player MPlayer with a selected video from the computer system, selecting the video from the local computer system to convert it into an executable which can be played regardless of codecs installed on a computer system for it is only needed for some video formats like wmv or Real Player only but not mostly for others. You can also see preview before conversion, user can choose between fullscreen and compact mode, make the video auto quit after playback, make it stay on top or loop. The recipients should click on executable file that has been send to them without disinclination.